Quiet Secluded 'Hilltop Log Cabin' Get Away Vacation Cabin Rental with king bed! Nestled in the beautiful Shenandoah Valley, Hilltop Log Cabin is the perfect relaxing getaway. Hilltop offers 2 acres of secluded property line with beautiful panoramic views of the mountains. Hilltop can accommodate 6 guests comfortably with 2 bedrooms with 1 king size bed and 1 queen sized bed, 1 full size futon in the loft area, and 2 full bathrooms. The master suit bathroom features a 2 person Jacuzzi tub and stand up double shower. It also features a fully equipped kitchen with all major appliances. Enjoy modern amenities such as flat screen TV’s, satellite service, free internet, and a large 6 person outdoor hot tub. Hilltop Cabin offers all the comforts of home such as washer/dryer, linens provided, and central ac/heat. 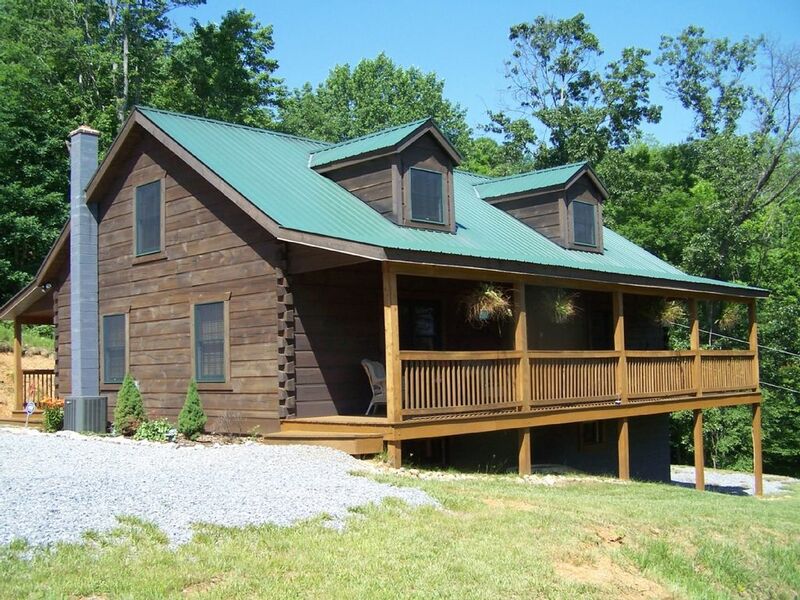 Nestled in the beautiful Shenandoah Valley, Hilltop Log Cabin is the perfect relaxing getaway. Hilltop offers 2 acres of secluded property line with beautiful panoramic views of the mountains. Hilltop can accommodate 6 guests comfortably with 2 bedrooms with queen sized beds, 1 full size futon in the loft area, 1 queen size sleeper sofa in the living room and 2 full bathrooms. The master suit bathroom features a 2 person Jacuzzi tub and stand up double shower. It also features a fully equipped kitchen with all major appliances. Enjoy modern amenities such as flat screen TV’s, satellite service, free internet, and a large 6 person outdoor hot tub. Hilltop Cabin offers all the comforts of home such as washer/dryer, linens provided, and central ac/heat. We also have a AM/FM CD player and select board games and puzzles for those rainy days. Relax and get in touch with nature at this secluded cozy cabin. Enjoy a morning cup of coffee while rocking on the front covered porch. If you’re lucky you might catch a glimpse of the local wildlife such as rabbits, birds, and deer that frequent the surrounding property. Hilltop is conveniently located to all major attractions. Spend the day hiking the Shenandoah National Park, touring the Luray Caverns, or splashing down the slides at Massanutten Resort's year round water park. Local outdoor activities include horseback riding, wineries, canoeing, river tubing, fishing, site seeing, and much, much more. After a full day of fun and the sun sets over the mountain throw a steak on the grill and enjoy a relaxing soak in the hot tub. After the sun sets and the stars illuminate the sky enjoy the outdoor fire pit area and don`t forget the marshmallows. Whether your seeking the thrill of the great outdoors or just want to get away from it all Hilltop Log cabin is where memories are made to last a life time! Hilltop cabin is located on Crooked Run Road Shenandoah, Virginia. All roads are paved except for the inclined gravel driveway leading up to the cabin. All vehicle types suitable during good weather conditions but will require 4 wheel drive during inclimate weather such as snow and ice. Please ask before bringing motorcycles. The owner is not responsible for road conditions due too inclimate weather. My name is Charles and I am a native resident of Page County and have lived within 5 miles of Hilltop Log Cabin all my life. My sister owned the cabin and ran the business for several successful years but regretfully she had to give up the business so when she approached me with the offer to buy the cabin I jumped on it. I am a poultry grower by trade but was looking for some type of business to run after my retirement. I am now currently look at more properties to use as vacation get a ways. I have 3 wonderful sons and many grandchildren which I adore. I enjoy the great outdoors and nature and found those qualities in this cabin. I hope at some point in my life I can actually retire to my cabin and live out my golden years. Hilltop Log Cabin is a beautiful log cabin built high on a hillside. In the Fall you get a great view of the mountains and all the local wildlife. I try to make the cabin very comfortable with that at home feel. Our guest rave about how nice the cabin is but that it remains at a reasonable price. I want my guest to come and enjoy all the amenities that the cabin offers plus the great activities offered in this beautiful county. We are centrally located to all major attractions usually within a 20 minute drive or less. We offer that small hometown feeling yet still very close to major city life. Price, Price, and Price. We strive to keep our rates very reasonable in a very competitive market. Although that doesn't mean that we skimp on amenities. This cabin offers almost every amenity that you could desire during your stay! Located off RT. 340 on a secondary road. Within 7/10th of a mile from a public boat landing/fishing area for the Shenandoah River. Best mountain view from the cabin is late Fall and Winter after the foliage has fallen. All linens for bedding and bath are provided. 6 person hot tub. The hot tub is a secluded area. You can not be seen in the hot tub from the road and any neighbors are at least 300 yards and they can not see the hot tub. *No smoking inside the cabin outside only -- 6 person HOT TUB!!! *Pet friendly - only well trained dogs that are 35 lbs. or less will be allowed. $10.00 per dog/per night. *A small starter supply of toilet paper/paper towels/dish soap/trash bags is provided. *CANCELLATION POLICY: If Guest(s) wishes to terminate this agreement, Accidental Damage fees and Administration fees for all services involved with procuring this rental for Guests are non-refundable plus 20% of the rental amount shall be forfeited if cancellation is made more than 30 days in advance of the arrival date. If cancellation is made within 30 days of the arrival date, 100% of the total rental amount shall be forfeited. Until booked, rates are subject to change without notice. *Firewood is not provided. You can purchase bundles at local stores.Campfire in designated area only! Campfires not allowed under a county wide burn ban. *No hunting or target practicing is allowed without prior permission. Wonderful cabin, very cozy. Perfect getaway! The cabin is exactly as described. It is clean and has all the accommodations that we were looking for. We LOVED using the hot tub. It is off the side of the house but still secluded enough to enjoy the scenery and feel like you are all alone except when the rare car comes down the street. Sunday morning there were no cars at all and it was amazingly peaceful sitting on the porch with a cup of coffee and then enjoying the hot tub one final time. We sat listening to the birds, frogs and the sound of the river/creek. We look forward to coming back soon. We had a wonderful family weekend getaway! We had everything we needed right there. The views we're incredible, the privacy, the comfort of the home, hot tub, cleanliness...everything was perfect! My parents are already talking about going back over the summer! We had a wonderful time at this great cabin! This place is great! It's clean and spacious. The owner is wonderful. There are plenty of towels, etc., etc. The only reasons it didn't get a 5 were minor. The neighborhood was a bit questionable----just didn't feel 100% comfortable walking around it. But, it was an excuse to just relax at the private cabin which was wonderful. Also, it would have been nice to have a few more dishes so we didn't have to run the dishwasher after every meal. BUT, we really enjoyed it and would stay here again. We loved the cabin, the location, everything! This was a great cabin for our weekend getaway. It had everything we needed for a typical rental home and more. The home is in a great area being close enough to local attractions but also out in the country. The hot tub was so relaxing and a great way to unwind after a busy day of activities. King size bed was so unbelievable comfortable and made us want to upgrade our bed. I would highly recommend this to any of my family or friends. You wont be disappointed in your stay! Hilltop Log Cabin is secluded in a mostly wooded acreage. You will be 5 miles from the Main St. of Shenandoah Va. for local shopping and restaurants. Prices based on 2 adults, extra adults $25.00 per adult/per night Dogs $20.00 per night/per dog under 35 lbs - 2 allowed 2 Free children, $10.00 per extra child/per night $20.00 non-refundable Accidental Damage Waiver required I allow online booking however, the system will not calculate certain fees correctly such as the pet fee so I will adjust the quote prior to booking.